The Paleo take on salt has always been a little defensive: sure, eating a bunch of ultra-salty processed food is bad, can we really put that up to just the salt? And is it really relevant to adding salt to whole foods at your own table? The evidence that salt actually does cause high blood pressure isn’t great, and the typical Paleo line has been to salt to taste and not worry about it. Recently, a trio of new studies came out with some supporting evidence: they didn’t find any compelling proof that salt per se causes high blood pressure. In fact, the studies found that too little salt seems to actually be as bad as too much! But the studies also pointed to another interesting question: the interactions between dietary sodium and dietary potassium. Sodium and potassium are both electrolyte minerals necessary for life. Sodium is found in very small amounts in fruits and vegetables, but the vast majority of our sodium intake comes from salt. Most people in the modern world get the majority of their sodium from prepackaged food, and only a little bit more from adding salt at the table. This is true even if the food doesn’t taste “salty:” bread, ice cream, and cookies, for example, are often all full of salt. On Paleo, with almost all the pre-packaged foods out of the grocery cart, your primary source of sodium is likely to be salt added at the table (or during cooking). Chemically, table salt is a combination of sodium and chloride, about 40% sodium by weight. Sea salt has exactly as much sodium as table salt. If you get a special “low-sodium” salt, it will have less sodium, with the specific amount depending on the product. 1 teaspoon of salt: 2,300mg of sodium. 1 package of ramen noodles: 1,702mg. 1 serving (about ½ the can) of Campbell’s homestyle chicken noodle soup: 940mg. 1 hot dog: 500+mg (depends on the brand). Beet greens: 1,309mg per 1 cup cooked. Plantains: 930mg per 1 cup cooked. A standard “high-sodium” diet is a “high-processed-food” diet. Such a diet is probably also low in vegetables and fruits, which would make it deficient in potassium. So are the resulting health problems due to the presence of sodium or the absence of potassium? The DASH (Dietary Approaches to Stop Hypertension) diet is a pretty effective diet for lowering blood pressure, at least compared with the standard American diet. It’s lower in sodium – but also much higher in potassium. So are the improvements thanks to the reduced sodium or the increased potassium? It’s worth considering, at least, that high blood pressure is really about mineral balance, not just about sodium. And that would imply that lowering sodium as much as possible is only addressing half the problem. What’s the Best Sodium:Potassium Ratio? So if blood pressure is really about ratios instead of restricting salt, then what’s the target to aim for? Nobody knows for sure, especially considering that we all metabolize sodium and potassium differently, and that some people need more than others (e.g. athletes who sweat a lot need more sodium and more potassium to replace the minerals they lose through sweating). The recommended daily intake of potassium (4700mg/day) is roughly double the recommended daily level of sodium, but considering that the recommended daily intake of sodium is based on the assumption that sodium causes high blood pressure, it’s not quite clear how accurate this is. Paleolithic Nobody really knows; estimates vary. In the actual Paleolithic, ratios of sodium:potassium intake have been estimated as low as 1:16, although it’s always important to stress that nobody really knows what anyone ate in the Paleolithic, and it’s extremely possible that they ate what they did because they could get it, not because it was optimal. Paleo is not about imitating cavemen; it’s about using evolution to figure out what’s actually healthiest for humans to eat. With that said, it’s probably safe to say that most people on a typical Western diet could stand to lower their sodium:potassium ratio by eating a lot more potassium than they do right now. Whether the optimal ratio really is 1:2 or whether it’s even lower, chowing down on ramen and canned soup isn’t the way to – and that brings us to a potentially more important question: what do all these numbers actually mean in terms of food? 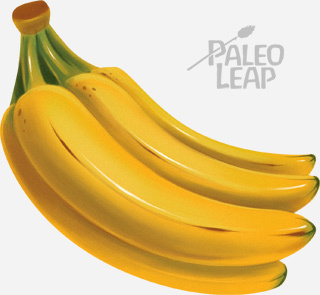 If you’re eating Paleo, do you automatically fall in the healthy range, or is there something you might want to pay attention to? The Paleo day is doing better than the sodium-reduction recommendation even though you’re adding salt to every meal. That’s the power of eliminating processed foods and eating lots of vegetables! Without anything from a box or a package, it’s actually quite easy to undershoot even the most conservative recommendations for sodium intake, and significantly improve on that sodium:potassium ratio. The upshot: there’s really no need to count or track sodium on Paleo; even if you’re salting your food to taste, it’s very hard to get too much. If you’re eating Paleo, you’ve already achieved a superior sodium:potassium ratio without ever worrying about it – and with all the problems in the world, who needs another thing to keep track of? 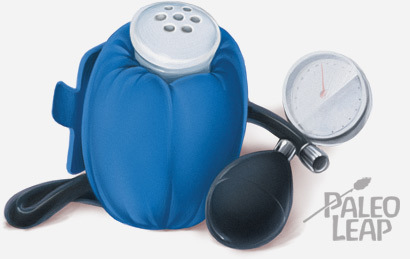 Healthy blood pressure isn’t about shunning the salt shaker. It’s about avoiding processed junk food and eating plenty of fresh plant foods. Eating a vegetable-heavy Paleo diet already gets you there – no need to restrict salt at all. 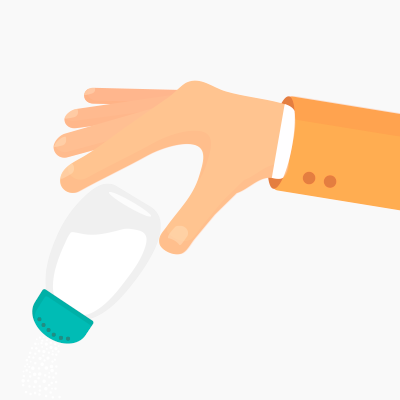 Remember that the newest studies found that extreme salt restriction might even backfire: there’s nothing unhealthy about salting your food to taste, if you do it in the context of an overall healthy and potassium-rich diet.